Michael May joined the NPT in the spring of 2006 as Executive Director. Michael has an extensive background in architectural history and preservation planning. He holds a Master’s degree in Historic Preservation Planning from Columbia University’s Graduate School of Architecture and Planning. Under Michael’s direction, the NPT has had many successes including the addition of The Mary Helen and Michael Fabacher Scholarship Program, completion of House Histories and Markers, gained new easement properties, published The Neighborhood Book Series, increased membership and expanded the NPT’s reach within the Nantucket community. 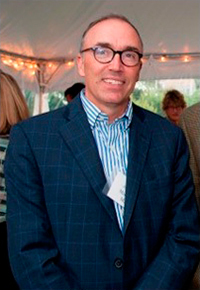 Michael is also very active in the Nantucket community as a member of the HDC workgroup, South Church Preservation Fund and Nantucket Historical Commission. He has participated in roundtable discussions for the ‘Sconset Trust and taught courses for the Builders’ Association. He currently spends his time with his partner Housley Carr and their dog in Nantucket’s historic village of ‘Sconset and Carversville, PA.
Front Street—for its overall streetscape. This historic lane is the perfect combination of historic cottages, spotted with lush gardens and topped with a view of the ocean. While in living in Virginia I worked as a realtor for 10 years marketing farms and estate properties. Summer—not only is the weather perfect but it is a time when people from around the world come to the island. You have the opportunity to meet interesting new people and catch up with friends who may only visit a few weeks or during the season. Michelle joined the NPT in February 2018. Michelle’s work with the NPT is a continuation of her commitment to preserving Nantucket’s sense of place. She most recently served as the Executive Director of Sustainable Nantucket for the last ten years. I am a painter– studio artist by training– and keep 3 plein air painting kits in my car during the warmer weather. One for me and one for each of my two daughters. I love the late summer / early fall on Nantucket. September and October are just amazing. The weather is usually gorgeous. It is often still warm enough to swim. The foliage is beginning to turn but flowers are still blooming. The fall harvest season is in full swing. The crowds slow down but the restaurants are still open. I try never to go away in September or October because I don’t want to miss one moment on the island. Mary Bergman joined the NPT in January of 2018. Originally from Provincetown, MA on the tip of Cape Cod, Mary has lived and worked on Nantucket since 2014, but her ties to the island go back to the 1920s when her great-grandparents lived on India Street. She has a BA from Smith College and an MA from American University. Front Street in ‘Sconset and Smith Point in Madaket. Both neighborhoods feature interesting architectural details, are perched on the edge of the island, and catch the first or last rays of the day. I am co-chair of the 2018 & 2019 Nantucket Book Festivals and can usually be found writing. While I love the slower pace of life winter offers, summer on Nantucket can’t be beat. I love that it is light outside from almost 4:30 in the morning to 8 at night.